By now, most K-pop fans are familiar with Hello Baby, the television series that airs every once in a while on KBS and features a popular idol group trying their hand at parenthood by “raising” a young child, usually four to five years old (or less). The latest season shows the five boys of B1A4 working hard to earn the love of Eun-gi and Hyun-woo. And while I enjoy a more-than-healthy dose of cuteness from my favorite K-pop groups, like any other fan, I have never understood why Hello Baby has existed for more than three seasons when Invincible Youth didn’t make it past two. Is it because the sheer number of Shawols fantasizing about what a wonderful father Minho would be keeps the viewer counts up? Or do viewers just want a closer glimpse at idols “personalities”? And more importantly, what really goes on behind the scenes of this show? The first season of Hello Baby consisted of 22 episodes that showed us the motherly sides of the nine members of Girls’ Generation. The girls took care of Kyung-san, an adorable baby boy who was only a few months old when he appeared on the show. I’m not sure how much the producers had to pay Kyung-san’s parents for them to allow their baby to appear on national television before his first birthday, but it must have been a hefty sum. The girls did a decent job with Kyung-san: Sunny‘s kind and nurturing side won her “Best Mom” for the first four episodes. Tiffany and Yuri also showed us that they had a ways to go before they became mothers — their interactions with Kyung-san were a little stilted and it was easy to see that they didn’t have much experience with younger children. 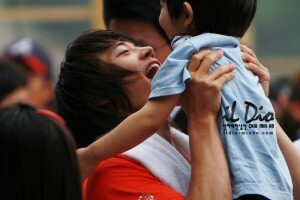 It’s not surprising — I’m sure idols don’t get to go around playing with young children on a regular basis. Unless you’re Yunho, of course, who just seems to gravitate to the nearest baby. The girls also worked with “dads,” male celebrities invited to guest-star on one or two episodes of the show, throughout the entire process. My favorite “dad” was definitely Lee Min-woo of Shinhwa — he was absolutely adorable with Kyung-san and seemed quite enthusiastic on the show. 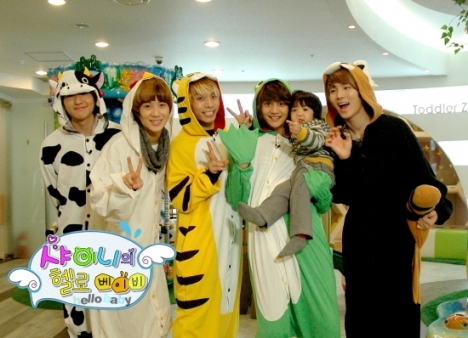 The first season of Hello Baby was a hit. At the time, Girls’ Generation was still a relatively young group and it gave their popularity a boost in terms of giving fans a look at their individual personalities. Taking care of a young child is an intimate process, even though stars on the show only spend time with said baby for a few hours every week or two. The show had a more genuine feel to it because of that, but that quickly changed when the producers brought male idol groups to the club. Producers of Hello Baby hit a jackpot when they invited SHINee onto the show. The boys spent a lot of time with Yoo-geun, the four-year old boy who was cast on the show. They played games with him, cooked for him, took him to an indoor playground where they dressed up in animal suits (both hilarious and slightly scary), and even furnished a bedroom for him. When they were away from South Korea, the boys created video messages for him. The competition factor was kept by the show — Yoo-geun was asked to rank his “appas” from position one to five every week. However, this season felt much more artificial than the previous one, simply because SHINee’s group dynamic wasn’t quite developed enough at that point for the friendships between the boys to feel real to me. Almost all the scenarios felt way too set-up to be convincing, so after only two episodes of SHINee’s season, I got pretty bored. However, there was a lot of one-on-one interaction between the boys and Yoo-geun, which made for some cute moments between the yawns. But it was pretty clear at that point that the intentions of the show were to increase popularity for idol groups by bringing out their “cute” side by filming their interactions with a young child. Now, five seasons after Girls’ Generation first took the Hello Baby baton, I’m sitting here wondering why this show is still running. After giving every season (minus the Sistar and Leeteuk one) a fair chance, the appeal of Hello Baby is not getting through to me. Sure, there are lots of orchestrated cute moments with the kids and between the members, but a lot of the time I just sit in front of my computer and pray that Mir will not become a father any time soon. There are occasionally pleasant surprises, such as Lee Joon, who deserves credit for attempting actual discipline with the kids instead of showing favoritism like Thunder and Seungho, but beyond that, Hello Baby seems to be airing more flaws of a group than promoting their nurturing, likable side. The mechanics of Hello Baby are hard to understand. Parenting is a touchy area for most people, so criticism of a group is to be expected if they are cast on this show. Let’s face it — no idol group is perfect, and it’s insane to expect them to be good at everything under the sun, including interacting with kids. So why do companies still aim to get their groups on the show if they are prone to being bashed on the Internet for one wrong move, such as pushing a little girl who isn’t hungry at dinnertime away from the table? Easy enough to answer — while the backlash can be intense (one wrong move can cost you more than just a few fans), the publicity from being on this show is worth it. It’s hard not to fall in love with Sandeul after watching his playful antics around Eun-gi (as if we needed help in the first place), and sometimes, you just have to run that risk. While Hello Baby will never be one of my favorite variety shows, I still have to admit that it is a good ploy for publicity. And I still find myself being pleasantly surprised at what an idol group can do (i.e. cook delicious-looking kimchi fried rice), so I guess for now, Hello Baby is doing its job well at converting and maintaining fans for idol groups. 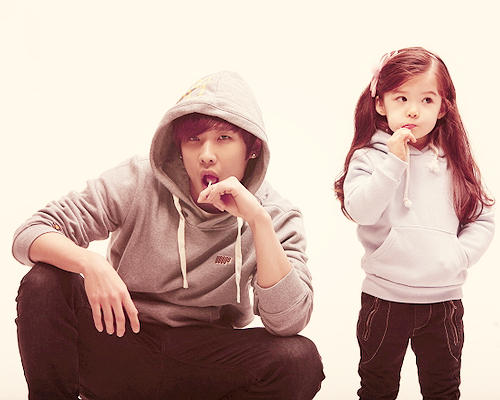 What do you guys think about Hello Baby?